Looking at this streamer/DAC pretty hard. Anyone have any experience with it? Cool, thanks. Will it read a 2TB HDD (Fat 32) FLAC? I've only personally seen it in limited demo environments, but all sources say that it is worth the upgrade vs getting the Node 2. I have heard that the Aries Mini is still the preferred solution for the price point, but the 2i is very close and a good alternative as the Aries Mini becomes harder to find. Great info! Thanks Stang! Seems like it will work as I will keep it plugged in all the time and the HDD has its own power supply. I have a node 2 and love it... Does everything I need it to do and they are constantly updating the UI and software. They listen and respond to their end user forum community The app also works with android which the Aries does not. If the 2i is improved then it is good. Sure arent any deals on em! A used one posted today for $400. It was gone in hours. I'll be picking up one later this year. I'll use it "transport" mode with HDD attached. If you get a Western digital with power supply, it'll power up/down automatically with the node---which is a neat feature. I use a WD "My Book" 2TB w/my Oppo. Mine is a Rosewell? something like that. Has its own power supply. Thanks! Im gonna get one. Gotra pay Uncle Sam first tho...sigh. Cool. Let me know how you like the interface. I’m about to pickup the new MDC BluOS 2i to use mainly for Tidal and MQA. How do you like the new BluOS 3.2? The last time I auditioned the interface was when version 2 was out. Are there much noticeable improvements? I didn’t stick with the old interface because I felt like I had to use the Tidal app to explore new music and then the BLuOS app to actually play. Is this your experience as well? I use it. I believe it is good for the money. Run the coax out to the Emm Labs DAC2x. Node 2 arrived today. Nice sounding streamer. A lot of bang for the buck here. Reads my 2TB HDD just fine and have access to all files quickly. Using AQ Golden Gate ICs. Sounds better than dig coax, but havent tried toslink yet. Does a ton of things that ill probably never use, but nice to have available I guess. Now that the 2i is out these should be more available at deep discounts used. Grab one and ya wont be disappointed for the money. So does this stream radio stations? Do you use your laptop or smart phone for display? Does it use bluetooth or wifi or both? Buddy of mine is interested in streaming from Pandora or Tidal but not sure how to do it cheaply. 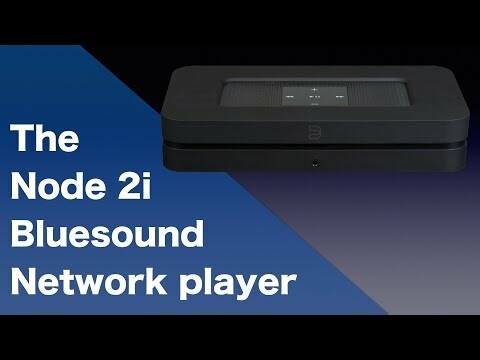 Bluesound will allow any Bluetooth enabled smartphone, tablet, or computer to stream music to a Bluesound Player. Now you can stream music from Pandora®, Sirius/XM®, Apple Music®, TDC Play®, and many more services to your Bluesound system. ... The use of other Bluetooth 4.0 adapters may not be fully supported by Bluesound. Any of you guys get this, please do a good review of this unit. I'm seriously considering one but need to know a few things first. If it will pull iTunes from a windows PC. Some reviews say it won't, others say it can. The App- gets good reviews, others say it stinks. What I need to know is...if you can search in any category, add and subtract to playlists easily, if it crashes constantly or freezes. Support of Napster ? Though I may move to Tidal if their library is deep enough. Q doesn't seem to be very deep in the library judging by the other thread. Reviews are fickle, as some don't specify if it's the older node 2 or 2i. It's my understanding the app has also improved from the node2. The app is the same between all Bluesound players. The app is stable and prompts you to perform updates when needed. Wifi and internet connectivity is the weakest link and that is the same for all network players. The 2i has updated it's WiFi capabilities although I had no issues with the Node or the Node 2. I also recommend using it with Roon in order to simplify bringing all of your online music services and stored music libraries. Roon will also allow "like" devices to have a multiroom experience... Airplay syncs with Airplay... bluetooth devices with bluetooth etc...Roon is simply the best audio related software I have ever seen or used and makes it all simple after a brief but easy ramp up. Roon offers a 2 week free trial. What do you mean by weakest link ? Wifi drop outs ? Never had a problem with drop outs from my Sonos so I dunno if we can say it's relative to all network players. If that's the case, being prone to drop outs, that would put it off the list for me.